50 Cent's latest album is more of the same old 50. Eleven years after the release of Get Rich or Die Tryin’, 50 Cent is still alive. Reportedly one of the five wealthiest rappers alive, 50 has understandably become increasingly less motivated in his music as the years go by. His passion for making music is still there, but the unrelenting drive for success that fueled the honest emotion behind tracks like “Many Men” is something that can’t be faked. Needless to say, 50 Cent has been unsuccessful in his attempts to live up to his classic debut. The title Animal Ambition attempts to flip the perception and make you think that 50’s latest album won’t be as lackadaisical as his recent efforts. Don’t let the title fool you. This is more or less the exact music that 50 cent has been making for the last few years. Everything from the songwriting to the production is tired and forgettable. 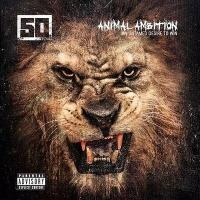 50 is comfortable recycling the same flow and subjects heard on 5 (Murder by Numbers), making Animal Ambition virtually indistinguishable from the preceding album. With that being said, 50 Cent is a rare case of someone that can almost get away with that. 50 Cent is one of those rappers whose voice was just made for rap. His charisma is enough that he could read the phone book and get your head bobbing. As effortless as it may be, Animal Ambition still has its enjoyable moments. It’s severely lacking in creativity, and there’s nothing beneath the surface to spark conversation, but it makes for decent background music for when you’re counting money or for when you’re tired of the radio stations on GTA V but not tired of the game. There are some glimpses of an almost but not quite vintage 50 such as “Hold On” and “Pilot” which have some of his best flows and hooks on the album. “Irregular Heartbeat” lays a simplistic yet menacing beat for 50 and Jadakiss, although neither delivers a particularly memorable verse. “Hustler” serves as another standout thanks to a nice Jake One beat. These few highlights could make the 39-minute listen justifiable, but you wouldn’t be missing much by skipping Animal Ambition completely. Although fun, none of these songs are up with the best of 50’s career. What’s disappointing about 50 Cent’s recent releases is that he has shown that he can still make a good album. He has released a number of individual songs over the past couple years that are better than anything on Animal Ambition, from “My Life” to “First Date” to “New Day”. Maybe there’s still hope for Street King Immortal. Animal Ambition seems to be a collection of throwaways to hold over fans until the next major release. Then again, Street King Immortal has been getting pushed back since 2011 making you question whether it will ever come out. 50 Cent fans will continue to be optimistic that he will turn things around, but if Animal Ambition is any indication of the direction he’s headed, it wouldn’t be a good idea to hold your breath.